Their warning and coaching for you? “Recruiting an amateur to restore a treasured piece of artwork is probably not the best idea. So the art world and especially the art conservation profession should not be surprised that a 16th-century Spanish sculpture is now ruined.” As a short cut to proper and careful cleaning to bring back the original period appearance, someone painted over the Statue of Saint Jorge, changing its original colors in order to save some money… a total hack job… the destruction of history. Disaster response clean up companies and restoration contractors are a dangerous source of fast and cheap restorations. They are under pressure by the insurance company who wants to pay out the least amount of money possible and KNOWS NOTHING, and doesn’t usually care, about proper cleaning, maintenance and conservation processes on art and historical objects. 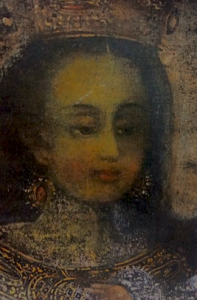 Smoke Damaged Art Restoration – PuroClean Testimonial from Scott M. Haskins on Vimeo. It is entirely appropriate and common for the more conscientious disaster response companies to subcontract out proper professional art conservation services for items that have financial, emotional or historical value. 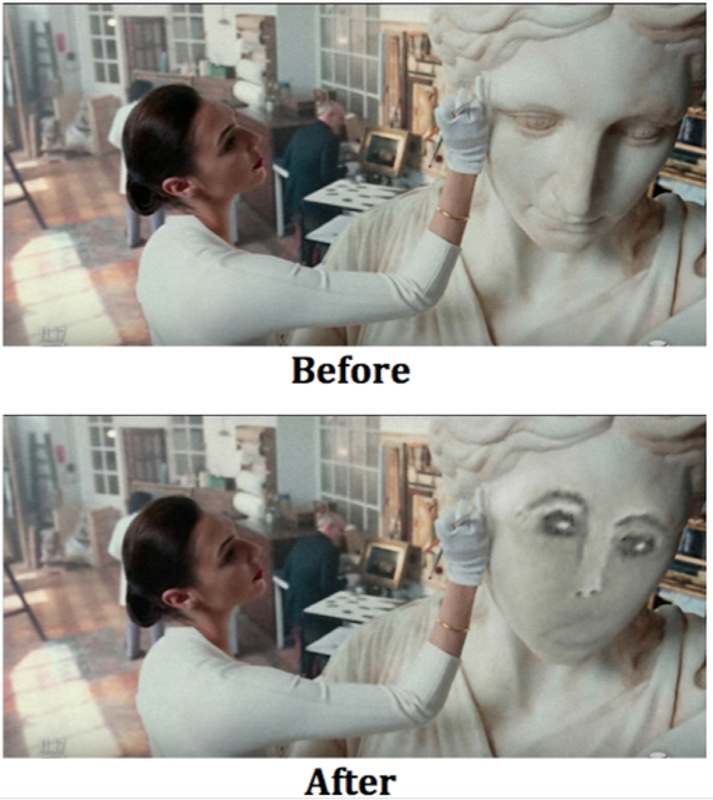 Thinking that restoring a work of art is like “fixing” anything else is a gross lapse of judgment. 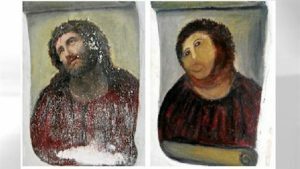 Artists who think that because they can paint a painting, they can restore any painting have no idea why works of art fall apart. They have no idea as to the aging problems of the materials/supplies they use for restoring. But most importantly, they don’t honor or respect the original creation, historical value or aesthetics, even if they are flawed (in their opinion). You may think this is funny! But the sad thing is that it happens all the time! 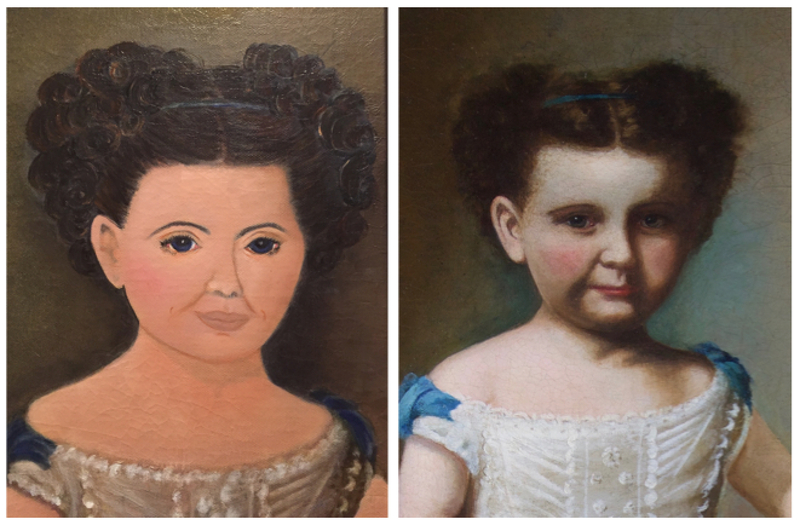 On the left is the photo of how the painting looked AFTER restoration when it came back from a “professional” Russian restorer in the Los Angeles area not long ago! IT DIDN’T LOOK ANYTHING LIKE THEIR GRANDMOTHER! As you might imagine, the family was crushed, as they thought the original, cherished oil painting of their dear grandmother was damaged beyond repair and lost forever. Actually, they were pretty “wound up!” On the right is the after-restoration photo of the ancestral portrait, AFTER all the previous “restoration” was removed and the original portrait was recuperated. You should have seen the owner’s/family’s faces! 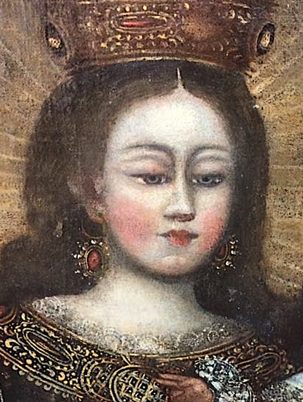 This exquisite Madonna and Child Spanish Colonial painting in the Franciscan archives of California is another sad story of botched over-restored valuable art. Look closely, especially at the details of the child Jesus… it looks as bad as “Behold the Monkey!! !” The first photo is the “restored” (repainted) old master! The second pic is after all the repainting was removed and the original painting was recuperated, preserved and restorer back to its original appearance. After we cleaned off all the repainting to re-reveal the original, we then properly stabilized deterioration, cleaned the underlying “gunk,” carefully and discretely inpainted only the paint losses, being careful to not slop over onto the original. Conservation grade varnish layers allowed the painting to glow and look its best. Professional conservation adheres to this and standards of practice. 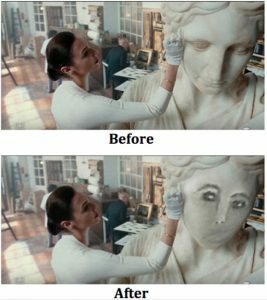 Art conservation – restoration questions? Free home and office visits/consultations with pick up and delivery in Los Angeles, Orange County, San Fernando Valley, Thousand Oaks area, Ventura area, Santa Barbara area, Las Vegas, Salt Lake City. See a tour of Fine Art Conservation Laboratories (CLICK HERE) Leave a comment. This entry was posted in Disaster/Emergency Response, In Lab and tagged Amateur Restorer Ruins Art. Bookmark the permalink.